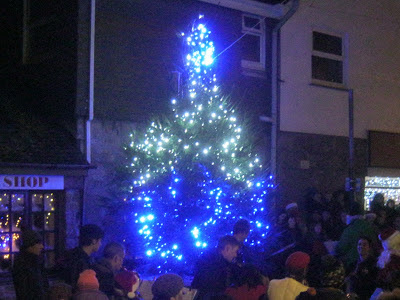 Lots of Christmassy events in St Ives on Saturday (3rd December 2016) as the festive season gets underway. From around 10.00 am to around 4.00 pm - Christmassy Town - including music, dancing, street artists and story telling on Fore Street. Father Christmas will be in his Winter Wonderland Grotto at Cohort Hostel at the bottom of The Stennack from 12.00 – 3.00 pm. There will be free craft activities for children while they wait to tell him what they’d like for Christmas. Entry to Grotto is £5.00 including a gift. Arts and Crafts for sale at Etsy Made Local - Christmas Fair at St Ives Guildhall. St Ives Textile Artist Jo McIntosh will be hosting Crafternoon at Cafe Art on Royal Square- from 2.00 to 4.00 pm. A fundraiser for the mental health charity MIND. Bring along a Christmassy (or other) craft project to work on. Make a donation and get a free cuppa. Tony Mason leads a 90-minute stroll from Porthminster to Porthmeor as he tells of the history and mystery of St Ives. Learn about the ancient fishing industry, the railway, our lifeboats, shipwrecks, the harbour and anything else that happens to catch the eye as you go along. Meet at The Malakoff at midday. Abstract artists Bobby Wotnot and Zoe Eaton will be showing recent works. Bobby Wotnot creates drawings with tiny dots and marks that are built up in a process resulting in a shimmering textured surface. Zoe Eaton works with paint, to create organic, abstract scenes that evoke an unknown landscape, or organism. Open from 11.00 am to 4.00 pm- also open on Sunday. Home cooked food and real ales at the best traditional pub in St Ives, music starts at 9.00 pm. Also on Sunday - a Sunday roast served from 12.00 pm then afternoon music with an acoustic set at 3.00 pm from the legendary Tyrone - Mr T.